Boiling the kippers in the bag is an excellent way of keeping cooking odours to a minimum. Gentle heat also means the kippers retain more of their omega-3 fats than if you cook them at very high temperatures. Boil the kippers in the bag, according to pack instructions. Cook the spinach, cumin and butter in a large pan over a medium heat for 5 minutes, turning occasionally, until the spinach has wilted. Meanwhile, poach the eggs. Bring a pan of slightly salted water to the boil, stir with a spoon to create a whirlpool, then crack an egg into the centre. Simmer for 3 minutes, then remove with a slotted spoon. Set aside and repeat with the remaining eggs. Strain the spinach and spoon onto 4 plates. 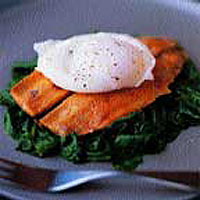 Place the kippers over the spinach, then top with the eggs. If you don't want to cook everything at once, poach the eggs first and keep them in a bowl of cold water. Slip them back into hot water for 1-2 minutes to reheat before serving.